The temporal clock said that it was Christmas Eve in London in the late Victorian era. The Doctor glanced at herself in the reflective surface of the switched off database console. These clothes weren’t right on every possible level. She turned and headed to the Wardrobe. This was the place where she had chosen nearly every outfit that defined all of her past incarnations. 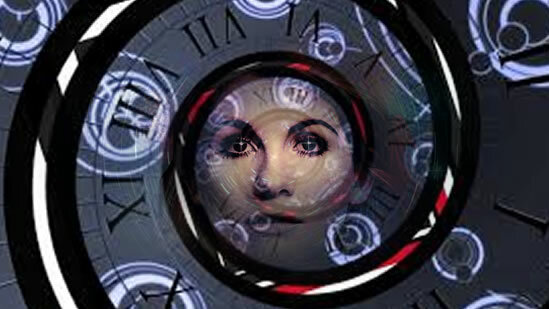 The semi-sentient nature of the TARDIS meant that all of them were hanging up in prominent view, now, providing a sort of retrospective on her life. There was the black jacket and checked trousers favoured when she had been an old man approaching that first, terrifying, unknown quantity of that first regeneration. Next to it was the hobo costume reminiscent of Charlie Chaplin that her second incarnation had chosen. Looking innocuous, insignificant, fooled a great many of her enemies in those days. When the superior intellect beneath the clownish exterior was revealed it was almost certainly too late. In her third incarnation she didn’t bother to pretend to be inferior in any way. Those elegant smoking jackets and dress shirts made for a striking figure nobody took for granted. Tall, broad-shouldered, wearing that big coat and insanely long scarf, incarnation number four was an enigma. The hair and widely grinning face led some to make the same assumptions as they did about the cosmic hobo, but those people were quickly disabused. That cricket-themed outfit was almost impossible to pin to any historical period. It was easy to fit into any time or place. Again, some people saw an open face, an easy smile, and underestimated this fifth incarnation. And what they made of number six was anyone’s guess. She smiled as she remembered the thinking behind the bright yellow pants and waistcoat and the ‘technicolour dreamcoat’ over it all. Again, it was timeless – though perhaps only because there was no time in the history of any planet quite that bohemian. Again, it was an outfit that let people make the wrong first impression. Her seventh incarnation chose to look like a friendly, easily approachable professor from one of the plate-glass universities. The question mark motif on the jumpers was a little over the top, perhaps, but it could be worse. That next regeneration had been tricky. She remembered it well. For a few crucial hours it could have been the end altogether. In those confusing, amnesia-filled hours, cut off from the TARDIS, he had found – stolen- a mis-matched set of clothes that were at least preferable to a shroud. Later, the new romantic look with the long velvet coat had been refined with help from the Wardrobe. Later still, fighting the Time War, rather more rugged clothing had been needed. That was why the War Doctor and the next incarnation had inherited that battered leather jacket. It was looking even rougher now. No wonder after yet another regeneration he had chosen something different. That slim fitting pinstripe suit reminiscent of the ‘Mod’ fashion of Earth in the 1950s had even passed without comment in Shakespearean London and among Agatha Christie’s upper crust set as the bad memories faded a little and he had been able to enjoy living in the moment a little more. And then there had been bow ties, Fez’s, top hats and Stetsons. There had been desperate times, but that flippant approach exemplified by the eccentric clothes had worked nine times out of ten. The tenth time had been a bit trickier. The Doctor smiled and reached for the sonic glasses that had gone with the most recent look. She tried them on, but they didn’t have the same effect. She put them back on the shelf and reached out to strum the electric guitar that went with the aging rock star look. The sound was discordant. She thought she still knew how to play, just as she was sure she could still get a tune out of a recorder or tap out a rhythm on the spoons, but these were new hands. It might take some practice. If there was time for practice. The Wardrobe had a suggestion for the temporal location. It wasn’t, she was quite sure, going to be a signature look, but it was right for this one time. She changed quickly – or as quickly as possible. This WAS the first time she had ever put on a corset. It was a modern one, not the contemporary whalebone affair, but it was still a little tricky. The dress was slim fitting with a well defined waistline and an ankle length skirt, buttoned up to the high neck. The boots had a dozen little buttons each, fastened with the help of a little metal gadget last used with the patent leather shoes of her first incarnation. A few accessories and she was a respectable Victorian lady. Respectable was something that hadn’t always applied. It might not in the future. But it would do for one quick visit. The Doctor stepped out of the TARDIS and looked around at what looked, at first glance, like a perfect scene from an old fashioned Christmas Card. “No such thing,” she told herself as she walked along the snow covered pavement, stopping to buy matches from the pinched faced girl trying to make a sale. She had no use for matches, but the girl had use for the coins she gave her. This was the Victorian London beloved of those Christmas card designers, snow, lamplight, carollers on the corner in buttoned up coats, barrows full of perishable foods being hawked by cheerful cockneys, hot chestnuts over a brazier. Match girls scraping a living, urchins looking for a pocket to pick to keep them from starvation or the workhouses…. Yes, this was definitely the late nineteenth century. And in the middle distance on a surprisingly fog free evening was St. Paul’s Cathedral. The Doctor smiled and turned in that direction. 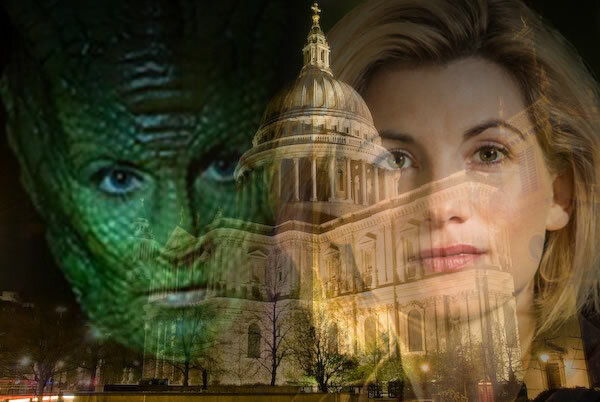 There were several places in London where she would be welcome on Christmas Eve, but there was only one where the complications of being newly regenerated wouldn’t matter. Paternoster Row was named for the monks in pre-reformation London who used to walk to the pre-Great Fire of London St. Pauls saying their prayers – the Pater Noster. By this time in the late Nineteenth Century it was renowned as the centre of book-selling. Given its pious connections, religious books were prominent, but many secular subjects were also available. The Doctor smiled ironically to see copies of HG Wells’ The Time Machine in one window. There was a memory worth treasuring from her sixth incarnation. Good old Herbert. Paternoster Row was also a genteel residential street where householders could afford their own carriage and a pair of horses, two or three live in servants and a comfortable lifestyle. These householders, with Christmas trees glittering in their drawing room windows were ready to enjoy a good Christmas involving plenty of good food as well as observing the Holy days. In the shadow of the great cathedral, after all, it was hard to forget the REAL meaning of the season. She found the house she wanted in the middle of the row. A short flight of steps brought her to the door and she rapped smartly on the brass knocker. Presently the door was opened by a familiar squat figure that never looked entirely comfortable in a butler’s uniform. “Do you have an appointment?” Strax asked a little stiffly and perhaps suspicious that a stranger knew his name. Strax couldn’t think of any good reason why not. He stood aside to let her into the warm hallway. From the drawing room the sound of Christmas music played on a piano drifted pleasantly. “Who should I say is calling?” Strax asked in a strained tone as if the polite phrase was difficult for him. It probably was. ‘Who should I blow to pieces with my laser cannon’ came more naturally to him. “Tell Madame that The Doctor is here,” The Doctor replied. Strax looked even more suspicious, but he went to the drawing room to announce the visitor. The piano music stopped abruptly. Strax stepped back out of the drawing room followed by Madame Vastra, elegant as always in a dark green dress that matched her complexion. Jenny Flint, in black silk-satin stood at the doorway, agog with unbridled curiosity. “Unfortunately, yes,” she replied, a shadow crossing her smile as recent partings came to mind. The Doctor smiled. Tyrants and despots, Daleks, Cybermen, foes as yet unknown, new friends and helpmate in the fight against them would come soon enough, but for now the prospect of turkey with old friends was quite enough. “Merry Christmas, Doctor,” Jenny said with a smile that could have been interpreted as flirtatious. But that was another story.